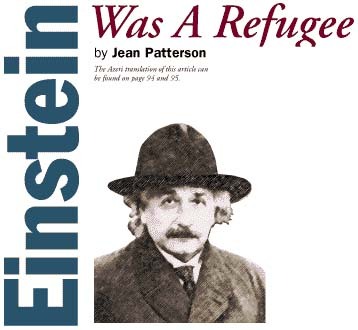 Einstein was a refugee along with untold millions of individuals throughout the ages. Here, we introduce a few of the many who have lived through the pain and uncertainty of exile and gone on to make extraordinary contributions to mankind's cultural and intellectual development. No other name is more likely to bring to mind the word "genius." As the author of the theory of general relativity, he changed fundamental ideas about space, time and gravitation. In 1933, Einstein-already a prominent German scientist-was accused of treason by the Third Reich, and his books were burned. He sought refuge in the United States and then used his influence and financial resources to obtain visas for other refugees. A saying attributed to Einstein demonstrates his remarkable attitude toward this struggle: "Politics are for the moment. An equation is for eternity." Thomas Mann (1875-1955)Winner of the Nobel Prize for Literature (1929), Thomas Mann fled Germany at about the same time as Einstein. Though Mann escaped to Switzerland for five years, he eventually ended up as Einstein's neighbor in Princeton, New Jersey. Mann was lecturing in Europe when he realized that to return home to Germany would endanger his life. He deeply lamented that it would mean leaving behind so much of his work: "all the manuscripts . . . everything was lost because of our emigration." The unknown future was frightening to him because, as his wife later wrote in her memoirs, "Mann felt himself to be too much of a good German, too tied to the German language and German cultural traditions to be able to take on a new form of existence without being extremely apprehensive." Mann continued his work as a writer and came to be known as the greatest German novelist of the 20th century. Among his most famous works are "Buddenbrooks" (1900), "Death in Venice" (1912), "The Magic Mountain" (1924) and "Dr. Faustus" (1947). At the age of 78, Mann returned to Switzerland and was given Swiss citizenship. He died two years later. The rise of the Third Reich in Germany also caused the forced emigration of the founder of psychoanalysis. Sigmund Freud was already world famous by the 1920s. His reinterpretation of the nature of the human psyche, as found in works such as "The Interpretations of Dreams" (1953), revolutionized psychiatry and psychology. When Hitler's army attacked Austria, proclaiming union with Germany, Freud's friends insisted that he leave Vienna. He was 84 at the time and had lived in Vienna for 79 years. He obstinately resisted. "It would be like deserting, like a soldier quitting his post," he said. But finally there was little choice, and he fled to London where he died later that year. Of course, not all famous refugees lived during the 20th century. A much earlier example is Publius Ovidius Naso (Ovid), one of the most celebrated of Roman poets. No one is certain why Emperor Augustus banished Ovid from Rome to Tomus, a small village on the Black Sea at the edge of the Roman Empire which is located in present-day Romania. One version of the story says that Ovid's work "Ars Amatoria" ("The Art of Love") was considered too lewd and inappropriate; another, that the Emperor's action was politically motivated. Of his exile, he wrote, "Thrust among hostile people, I suffer every ill imaginable . . . No one is further from home than me." During his 8-year exile, Ovid completed "The Metamorphoses," a collection of stories about Greek and Latin mythology which both immortalized his name and heavily influenced European writers such as Shakespeare and Goethe. If Dante had not been exiled, his striking visions of heaven and hell may never have inspired the masterpiece "La Divina Commedia" ("The Divine Comedy"). In turn-of-the-14th-century Florence, Dante held a political position aligned with a party which was expelled by the opposition. Never again was Dante allowed to return. According to one source, Dante spent the rest of his life wandering around Italy "full of protest, at war with the world throughout his life, with no thought of surrender." But it was under these circumstances that he penned his ethical and political conception of the world. Today, he is esteemed as Italy's greatest poet. Likewise, homesickness and frustration with politics served as creative inspiration for Polish-born composer Frederic Chopin. He left Warsaw to pursue a musical career, but the defeat of the Polish against Russian military rule prevented his return. He spent much of his life in Paris where he settled at the age of 21. After the French Revolution of 1848, he fled to England for about a year before returning to Paris. He died of tuberculosis the following year at the age of 39. Chopin is well known for his romantic piano music. Many of his expressive "mazurkas," "polonaises" and "nocturnes" are based on melodies from Polish folk music, which was his way of making a political statement. This sentiment appears in one of his letters to his family back in Poland: "You know how much I wanted to succeed in penetrating and making evident the deep feeling of our national music." The first female ever to hold the position of Secretary of State in the United States also experienced the uncertainty and tragedy of refugee life. Twice, Albright was evicted from her country. In 1939, when she was 2-years-old, her family fled Nazi occupation. Her father was a distinguished Czech diplomat at the time, and they spent the war years in England. They returned to Prague only to have to flee again when the communists took over Czechoslovakia in 1948. This time, her family was granted asylum in the United States. Albright went on to earn a Ph.D. from Columbia University and teach International Relations at Georgetown University. Under President George Bush, she was appointed U.S. Ambassador to the United Nations. In January 1997, President Clinton chose her to be Secretary of State. Political analysts anticipate that her childhood experiences as a refugee will make her sympathetic to the plight of individuals and nations which have suffered similar tragedies. Like Chopin, artist Marc Chagall borrowed extensively from folk traditions for his paintings-in this case, the folklore of the Jews in his hometown of Vitebsk (Belarus). 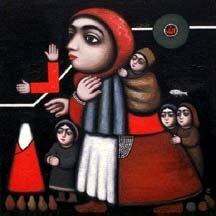 Images from his childhood such as fiddlers on roofs, onion-shaped steeples, bearded rabbis and joyous wedding ceremonies appear frequently in his dreamlike compositions. Chagall was a political refugee twice during his life: first in 1922, following the Russian Revolution, and again in 1941, when he left Paris for New York City because of World War II. French writer Victor Hugo is famous for novels including "Les Miserables" (1862), "The Hunchback of Notre Dame" (1831) and many volumes of poetry. Forced to flee from his native France in 1851, he had to disguise himself as a simple worker in order to escape, since he was already well known as a great writer. Hugo first tried to flee to Belgium but was refused. Then he thought about going to Switzerland, but eventually settled in the Channel Islands of England. Hugo writes of his experience there: "I love everything that suffers for freedom, for the fatherland and for justice; and I have peace of mind, even though it is always painful to tread on foreign soil." He did most of his writing and some of his best work during his 20-year exile there. He finally dared to return to Paris in 1870, only to have to flee again. Reflecting on his situation as a refugee, Hugo complained, "I don't even have the satisfaction of being oppressed by something great." Hugo was perceived as one of the most influential writers ever to shape French public opinion. When he was eventually able to return to Paris toward the end of his life, he was thronged in the streets by people cheering him, "Long live Victor Hugo!" Tatanka Iyotake (Sitting Bull), a famous Sioux Indian leader, struggled for the survival of his people on the Central Plains of the United States. Conflict broke out when the U.S. army invaded Sioux lands, supposedly protected by a treaty with the government. One of the most famous battles occurred in 1876, when George Custer and all of his soldiers were ambushed and killed by the Sioux. Retaliation by the U.S. government eventually resulted in the extinction of the buffalo upon which the Indians depended. In 1877, Sitting Bull led his hungry tribesmen into Canada where they remained for four years. In an emphatic statement to the U.S. government, he declared: "I want to have the white man with me, but not to be my chief . . . I want it to be seen and known that I have my rights." When another clash broke out in 1890, Sitting Bull died at the hands of police and soldiers while waiting to be rescued by his tribesmen. He is remembered as one of the greatest Indian leaders of North America. For more details, see the "Famous Refugees" series (1984-1989) published by UNHCR in their magazine, "Refugees." Dominique Miyet in UNHCR's Geneva office also assisted with this article.